England's historic capital was the centre of the British Empire for generations, and is imbued with an incredible sense of history; visitors to London often feel that the city is familiar because of all the iconic landmarks and famous buildings. Modern London has moved with the times and in addition to its proud ancient heritage it is a truly cosmopolitan city which continues to host prestigious world events. Anyone wishing to understand and explore the origins of Western culture will revel in a holiday in London, where traditional attractions still amaze and astound, but they will also be entertained by contemporary London, with its excellent restaurants, energetic nightlife, and enjoy world-class shopping. A holiday in London is enjoyable for anyone and everyone. Families will find plenty to intrigue and delight children; couples can revel in the romance still imbued in this old city; and culture vultures will be in heaven. The best time to holiday in London is during spring (April and May) when its famous parks erupt in a profusion of flowering bulbs, early autumn (September and October) when the trees turn into golden hues and skies are often blue, or summer (July and August) when the long evenings are a joy. Winters can gloomy, dark and cold but the cosy pubs and brilliant museums still beckon. Read more on London's Climate and Weather. -Spend a few hours getting lost among the myriad treasures of the British Museum. -Visit Madame Tussauds to meet all your favourite celebrities. -Gawp at the magnificence of St Paul's Cathedral and Westminster Abbey. -Get a sense of the city's rich history and see the crown jewels in the Tower of London. -Take a tour of the state rooms and Queen's Gallery at Buckingham Palace. -Sample punk culture at the fun and feisty Camden Market. 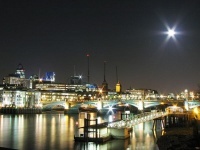 -Explore UNESCO-listed Greenwich, famous for its meridian and many museums. -Visit the South Bank, and marvel at the breathtaking views from the London Eye. England is a small country with a brilliant transport network and good roads; almost everything is easily accessible from London. Glorious attractions within reach include historic towns like Canterbury and Windsor, and grand buildings like Hampton Court Palace and Leeds Castle. Heathrow Airport, situated 15 miles (24km) west of London, is the busiest airport in the UK and one of the busiest in the world, and many travellers begin their London experience in this famous hub. International flights also commonly land at Gatwick Airport and London Stansted Airport. Get more information on Airports in London. -Once the largest and most influential city in the world, London is still the biggest city in Western Europe and one of the largest financial centres in the world. -London is the only city that has hosted the modern Olympic Games three times. -Aldgate Tube Station is built on a massive plague pit containing more than 1,000 buried bodies.